IronYi........: IM CDA week 2..
That felt like the longest training week ever! Monday- Went to Performance Labs to get LT testing done with Craig in Mill Valley. Testing determines my heart rate training zones and also tests my fitness level. Boy! Am I out of shape..yes fitness level has much room for improvement! I think more than both Chris and I thought haha! The discussion and explanation of numbers with Craig was quite interesting. I think I learned more about mitochondria in that one sitting than I did in all of school! Tuesday- Went to CT class with my new wattage numbers (lower) yet it didn't feel that much easier. Class is hard but always so much fun! Swum after work with Kara. Wednesday- Work has definitely slowed down with Christmas Eve! Did a morning run along the Embarcadero. Thursday- Merry Christmas and Happy Holidays to all! With morning hail and thunderstorms, I wasn't sure I was able to get out for my run. A moment of sunshine came through so out the door in my running shoes I went! I ran at the museum track in Golden Gate Park. It was beautiful and empty! I wished I had my dslr camera! Got some great news! One of my best friends, Heidi and her beau Alex got engaged!! I am so happy and over the moon for her! I was there when they met at an Ironteam info meeting and I was at the party when Heidi asked Alex out! I love it! There is hope after all! Haha. 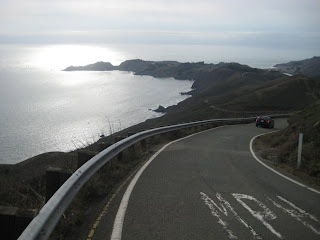 Friday- Kara and I did the Marin Headlands in the morning as Chris wanted me to do some hill repeats. I actually love riding the Headlands but it's descending down the backside that makes me nervous. The first and only time I've done it was maybe 4 years ago with the VeloGirls. I was so nervous and scared that I actually slowed my bike down, hit the barricade on purpose and got off my bike. Yup, I psyched myself out! This time, descending down went much smoother, no hitting my bike on the barricade. Just gripping on like crazy on the brakes with my calve/feet shaking like crazy! Haha. Right before Kara and I were to descend, I heard these two guys that had just reached the top of the Headlands say, "They're going for it!" See photo below- backside of Marin Headlands/Conzumel Drive. It really doesn't show how steep it really is but gives you an idea! Saturday- Kara and I went on a cold cold cold ride! Did I mention it was cold?! Made for the 3.5 hours in the saddle tough! After that ride, I took a nap and then went to Sports Basement to gather up some cold weather riding necessities! Did I mention it was cold this morning?! I can't decide which part of our day was better- Kara's bike falling over towards my bike while still on the roof of my car OR Kara pulling out her GoKart face mask (I have one too, haha) and putting it on and then asking, "how am I going to spit?" Haha! Good times! Sunday- Swum, biked and ran at the gym! End of what feels like the longest training week ever! nice work this week Yi! Just think... a few weeks of this and you will get used to 14 hour weeks!!! Really? 14 hour weeks are normal? I was hoping 11 hour weeks were normal.. :-0!